As we near the end of the 2013, we enter the season when major newspapers and magazines release their “Best of [enter year] lists”. So naturally we were curious about the level of representation of authors of color in last year’s New York Times Top 10 Bestsellers list. We chose to look at their most general bestsellers list, Combined Print & E-Book Fiction (adult), and looked at the top ten books for all 52 weeks of 2012. The results were staggering, if not surprising in light of our past Diversity Gap studies of the Academy Awards, The Tony Awards, The Emmy Awards, the children’s book industry, Sci-Fi and Fantasy Films, US politics, and Silicon Valley where we analyzed yearly/multi-year samplings and found a disturbingly consistent lack of diversity. An interview with author Charles Yu (below) helps give a glimpse of life as a living and working author of color in today’s marketplace. 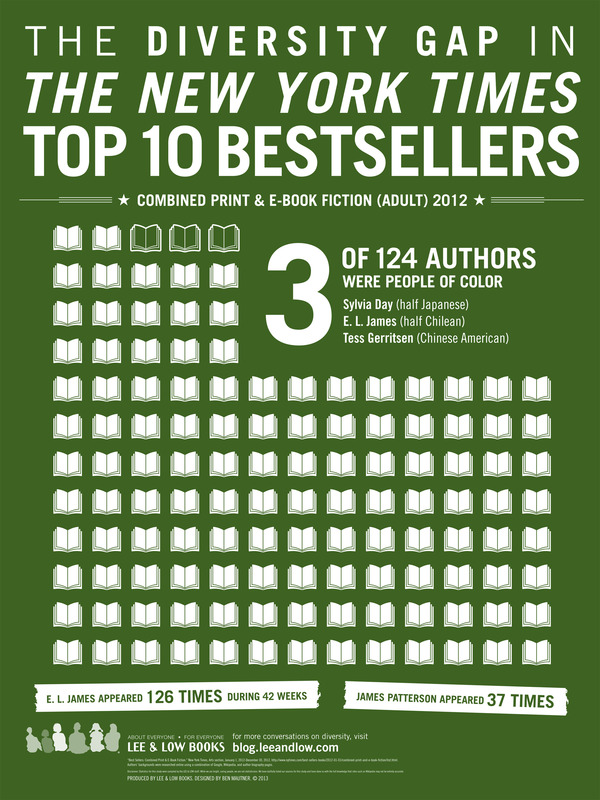 Do the statistics for The New York Times Top 10 Bestsellers list surprise you? Charles Yu: A little bit—maybe because in the spheres of my interest, there’s a fair amount of diversity of authors’ backgrounds. The NYT list, especially the top 10 or top 15, is really rarefied territory, though. Even books that are quite “big” can be far off from even being in the vicinity of the bottom of that list. It just takes an immense amount of distribution and exposure to get on the list. Did your parents encourage you to pursue a career in the arts? CY: They encourage my writing, but not necessarily as a career, and I think in some ways that is just realistic of them. They overcame a lot, sacrificed a lot, to give me opportunities here, and the odds are just so heavily against having enough success in the arts to make it viable as a livelihood, that I really understand. I would imagine I was not the only one. Do you think part of the problem of why there is a lack of diversity among authors of adult fiction is because immigrant families tend to steer their children away from jobs in entertainment and toward stable jobs such as doctors and lawyers? CY: I have Asian American friends and acquaintances in a wide range of fields who have or have not made certain kinds of choices, have or have not pursued careers in arts, entertainment, or other creative fields, who are currently in all different kinds of situations professionally, and their parents and circumstances and decisions have varied all over the map. But one common theme (at least for those roughly my age) is that they felt a gravitational effect, or funneling or some pressure, to go to grad school or professional school, to choose certain kinds of safe/lucrative/stable professions. Some of that’s part of the immigrant generational curve. The first wave comes (in my parents’ case, as part of a big influx of engineering/medical/science students from Taiwan starting in 1965), and they plant a foothold, socio-economically and culturally. They find good neighborhoods, companies, and school districts. And they want their kids to consolidate that socio-economic progress. But the success they have had, my parents and their cohort, that is the stability and the opportunity that allows someone like me to take more chances and to feel comfortable enough, in a lot of ways, including in a sense of being part of the culture, of the mainstream, to think I might be able to write a novel. So I would say that things are a lot different now, even just a generation later. For my kids and their kids, the amount of opportunity will just continue to improve. When I read your book How to Live Safely in a Science Fictional Universe I was struck by the complexity and familiarity that the main character had with his father. It was refreshing to see an Asian family in a setting that was not stereotypical. Family depictions like yours are extremely rare in science fiction. How important was it to you to depict an Asian family in your book? Do you feel the inclusion of an Asian family hindered or helped the marketability of your novel? CY: It was critical to me to have an Asian family. That was a necessary ingredient of the particular story I was telling about those particular characters. I don’t know if it helped or hindered marketability. If I had to guess, I’d say the title itself probably already (whether justifiably or not) creates an impression that it is going to be a certain kind of book, or in a certain genre or subgenre. I have received some personal feedback from readers who identified with the father-son relationship, or the family, including Asians, Asian Americans, Taiwanese Americans in particular. And I haven’t gotten any negative feedback that people felt that the ethnicity of the characters made it hard to relate to them. As a reader, do you support other authors of color by seeking out and reading their books? CY: I do—maybe not in any explicit program of seeking out, but in terms of the kinds of stories I am drawn to, in terms of me naturally seeking out a diversity of voices, yes. I am always looking for books outside my natural circle of curiosity. I have my own obsessions, things I can’t get away from, a region of natural interest, and I am continually circumnavigating that territory, keeping up on what’s new in there, deepening my knowledge of the area. I’m always trying to widen that circle, and it’s easy to see the stuff that’s adjacent, that’s close by, and include that. What I really need is to find books that are far from that circle, and for that, I rely on recommendations, happenstance, intentionally mixing it up—trying things that I think I might really not like—and, above all, staying as open as I can to things that don’t fit in with my normal patterns of reading and thinking. Do you picture yourself writing a book one day that will be on The New York Times Top 10 Bestsellers list? CY: Not really, and I think that could be a part of the problem in and of itself, that it’s not something I can conceive of as being reasonably realistic. I don’t know if it is expressly the lack of diversity that makes it seem so out of reach, but on some level, perhaps I’ve got this sort of tacit assumption that because of my particular background and areas of interest, it seems implausible for someone like me. I’m not sure I’m specifically striving to make the bestseller list, but just thinking about it (as a result of your question) is an interesting and I think ultimately fruitful conversation to have. May be soon enough, he will be on NY times top 10 list. Pingback: Where’s the Diversity on the NY Times Bestseller List? Ming, We have a lot of new Diversity Gap studies coming up for 2014 so stay tuned. We’ll definitely try our best to add 2013 numbers to this existing study. Thanks for sharing this infographic! I did a similar project in high school following up on diversity in children’s TV shows and the lack of representation was appalling (though I have to say Disney made some huge gains from what it was creating in the mid-1900s). This makes me think of Nicholas Sparks novels and why all the main characters are White. I mean there are also Blacks and Native Americans in North Carolina and I think he should include them as main characters in his novels, to add diversity, especially about their interracial relationships with White people and how they have cultural differences like their families disapproving of them or their families, usually main characters whose parents are an interracial couple. And for Black/White interracial characters, they would be dealing with racial segregation in the 1950s and 1960s. As a biracial (Asian/White) reader of some of his novels, that deal with differences between couples, I’d like to see interracial couples in his novels as main characters.